"And when soft toys get loved and loved, we can become Real." The Velveteen Rabbit (or How Toys Become Real) is a children's book written by Margery Williams (also known as Margery Williams Bianco) and illustrated by William Nicholson. It chronicles the story of a stuffed rabbit's desire to become real through the love of his owner. The book was first published in 1922 and has been republished many times since. 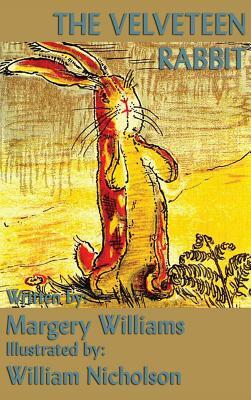 The Velveteen Rabbit was Williams's first children's book. It has been awarded the IRA/CBC Children's Choice award. Based on a 2007 online poll, the National Education Association named the book one of its "Teachers' Top 100 Books for Children." Nursery magic is very strange and wonderful, and only those playthings that are old and wise and experienced like the Skin Horse understand all about it. Like the Skin Horse, Margery Williams understood how toys--and people--become real through the wisdom and experience of love. This reissue of a favorite classic, with the original story and illustrations as they first appeared in 1922, will work its magic for all who read it. "A stuffed rabbit sewn from velveteen is given as a Christmas present to a small boy. The boy plays with his other new presents and forgets the velveteen rabbit for a time. These presents are modern and mechanical, and they snub the old-fashioned velveteen rabbit. The wisest and oldest toy in the nursery, the Skin Horse, who was owned by the boy's uncle, tells the rabbit about toys magically becoming real due to love from children. The rabbit is awed by this idea; however, his chances of achieving this wish are slight.